Customers who work with Mac OS X 10.8 or Mac OS X 10.9 can download FotoMagico 4 because the license key of FotoMagico 5 Pro can also be used with version 4. Got an idea for a show? Drag images and movies from your library into FotoMagico's storyboard. If you change your mind about the sequence order, drag your media files into the sequence you need. Want to add a transition? Click the options icon, then choose something from the transition menu. You can create your first show in a frew minutes. And that show will impress the daylights out of your audience. Telling a story is easier than you think. Putting the images and movies in the order you shot them takes care of most family and sports events. 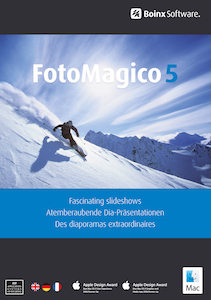 And FotoMagico has export presets for DVD, web, iPod, YouTube and HD display. So sharing your work is easy too. Out of thousands of contestants each year, Apple chooses the apps which embody the philosophy of the platform best and honors them with a very special price: the Apple Design Award. FotoMagico is the brainchild of Peter Baumgartner, a computer engineer and passionate photographer. Peter developed software for the Sinar digital camera back, the medium-format imager of choice for many professional photographers. He also wrote software for Leica, inventor of the 35mm camera and maker of some of the best lenses in the world. Peter wanted to make digital slideshows that were as impressive as the old analog ones, but found no software to meet his standards. So he decided to develop his own.